To report suspicious activities or a crime, email our tipline at tips@ci.bay-minette.al.us. The principle mission of the Bay Minette Police Department is the protection of life and property, the prevention and detection of crime, the apprehension of offenders, and the preservation of peace and order. In order to achieve our mission, members of the Bay Minette Police Department must maintain the confidence and respect of the public. This is achieved by receiving the highest quality of training available in law enforcement today and through constant and earnest efforts of all departmental employees to perform their duties in an efficient, honest, and professional manner by exemplary conduct in all their endeavors. The Bay Minette City Council voted unanimously in October 2017 to hire Al W. Tolbert, Jr. as the new Police Chief. It was a full-circle moment for Tolbert, who began his career in law enforcement with the Bay Minette Police Department. "I have spent my entire adult career serving my community in public service,” Tolbert said. “I am excited about this opportunity and look forward to serving the citizens of Bay Minette and the North Baldwin area as the Bay Minette Police Chief." Tolbert began his law enforcement career in 2000 as a patrol officer with the Bay Minette Police Department. Just three years later he became the department’s K-9 handler and was promoted to the rank of Sergeant and worked as a Patrol Supervisor until 2007. For the past 10 years Tolbert has worked with the Baldwin County Sheriff's Department in numerous capacities including K-9 Handler, Drug Investigations, Special Operations Unit, and as a member of the Mobile/Baldwin County Multi Jurisdiction Interstate Drug Task Force, Baldwin County Drug Task Force, and Patrol Division. Chief Tolbert has served the community in numerous ways throughout the years including as member of the Pine Grove Volunteer Fire Department, including a stint as Volunteer Fire Chief. He has also served on the Baldwin County E911 Communication Board and the Baldwin County Fire Chief’s Association. Bay Minette Police Department got a little praise in this story for being "dirty cops". Willie Walker came upon the scene of some officers helping an elderly lady cut her grass and pulled out his phone to record a commentary of witnessing these "dirty cops" at work. That video has now gone viral. "Look at this, those dirty officers are out there cutting this lady's grass," Walker said in the video. "I mean they got dust, grime all over them because they're cutting her grass." ​You can watch a television news story on the action here: http://weartv.com/news/local/allies-story. The City of Bay Minette, with its 8,000 residents, is served by a full service police department consisting of 26 police officers, one animal control officer and nine support personnel to carry out the day to day operations of the department. It is the fundamental duty of the police department to serve the community, to protect those in need, and to vigorously pursue those who commit crimes. Our employees carry out their sworn duties with honor, integrity, and love for the heritage of our community. The Bay Minette Police Department’s fleet of cars bear a familiar color scheme as the city works to streamline the look of its police force. When selecting a design, several ideas were submitted and the council chose one that included a black car with orange stripes and lettering, which matches the city seal and corresponds with the colors of Baldwin County High School. 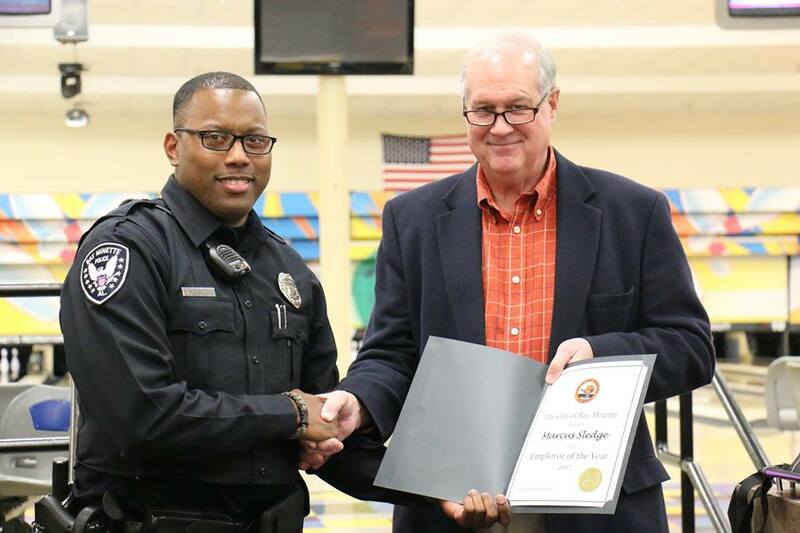 Officer Marcus Sledge was recognized as the Employee of the Year for the City of Bay Minette for 2017 and also received the Law Enforcement Officer of the Year presented by the Veterans of Foreign Wars Post 3568. The Bromley native has worked with the Bay Minette Police Department for two years. For the Employee of the Year recognition, Officer Sledge received multiple nominations from his co-workers, commenting on his initiative, work ethic, and proactive approach to law enforcement. One of his nominators wrote: "The work Marcus puts in on a daily basis is a credit to himself, the Bay Minette Police Department and what contributes to making the City of Bay Minette a safer place to live and play." Another nominator said "Officer Sledge is consistent with his attitude, also his work ethic is great. Officer Sledge shows great people skills and is able to keep calm in high stress situations ... He is easy to work with and eager to help at any given time." The announcement was made at the annual Employee Recognition Luncheon, held Wednesday at Strike City Lanes. The Patrol Division is the backbone of the police department and is responsible for the initial response to calls for service throughout the community. Officers assigned to the Patrol Division work 12 hour shifts. The Division consist of 4 Shift Sergeants. Each Shift Sergeant supervises a Corporal and several Police Officers. The Investigative Division consists of the Captain of Investigations and 2 investigators. These officers are responsible for conducting investigations of major crimes within the City and to work cooperatively with other outside agencies to resolve crimes and criminal activity that directly affect residents and other stakeholders in the City of Bay Minette. The Communications and Records Division is supervised by a Communications/Records Supervisor who oversees the daily operations of the department’s dispatching and records keeping functions. The division is comprised of a supervisor, 6 radio dispatchers, and 1 records clerk. Bay Minette PD’s Communications and Records Division uses the most advanced equipment available to law enforcement today. The radio system utilizes a digital format with multi-agency interoperability and computer-aided dispatch functions. All communications into and out of the dispatch room are recorded on digital voice recorders that are easily stored and retrievable on a secure hard drive. The records keeping function is supported by a computer-based records management system that is state-of-the-art and is accessible from anywhere in the world by internet. Police officers and other employees entering information into the records database can do so by laptop computer utilizing either a hardwired internet connection or wireless internet. This allows the police department to reduce paperwork and cut overall costs associated with storing documents and performing data processing functions. In addition, the system makes all reports and other information that is entered into the records management system immediately accessible, which is especially important for use in real-time crime analysis. The Police Chaplain Corps is a multidenominational organization which integrates the services of all the churches within the City of Bay Minette. The purpose of the Chaplain Corps is to provide faith-based services to victims of crime, domestic violence, abuse, or other issues affecting the quality of life of our citizens. Our Chaplains serve as volunteers on an on-call basis and have provided a variety of services to families and victims of crime such as counseling services, sheltering, and food for homeless persons, in addition to other community needs. The Police Chaplain Corps is coordinated by a full-time paid Police Chaplain, who is also a police officer certified by the Alabama Peace Officer Standards and Training Commission and the International Police Chaplains Association. Visit our Human Resources Department page to inquire about any openings or to complete an on-line application. Applicants for entry level Police Officer positions must be at least 21 years old and hold a high school diploma or GED from an accredited school. Applicants must pass a background check, oral interview, a physical ability/agility test, and a written exam. Successful candidates must also pass a psychological exam, polygraph, and general physical examination. If hired, candidates must also pass a 12 week police academy and successfully complete a 12 week field training program. Applicants for lateral entry positions must pass a background check and oral interview. Applicants for all other positions must hold a high school diploma or GED from an accredited school and pass a written exam and oral interview. The City of Bay Minette is an equal opportunity employer. 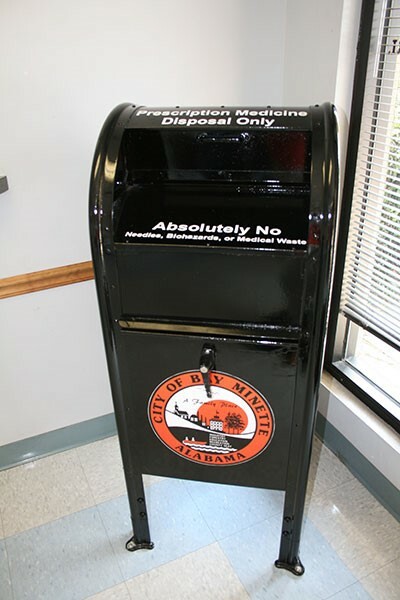 The Bay Minette Police Department is now offering a permanent option for people to dispose of outdated or unwanted prescription medications. A drop box has been set up in the lobby of the police station on North Hoyle Avenue and provides a “no questions asked” approach. Unwanted, unused or outdated prescription medications can be left in the drop box and the Police Department will take care of the proper disposal. Liquid medications should not be left in the drop box but all other prescription drugs can be safety discard there. The drop box is an old mailbox that was refurbished by the Bay Minette Public Works Department. The City participates in the annual National Prescription Take Back Day, sponsored locally by the Baldwin County Community Alliance. This permanent drop box helps to expand on that service. For more information about this program, click on a story link here or call the Bay Minette Police Department at 251.580.2559. The Bay Minette Police Department does not distribute patches, logos, or other agency identifiers without a written request from a certified law enforcement officer or employee on official departmental letterhead signed by the agency Director.